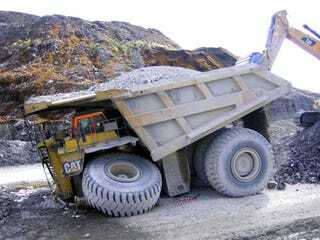 A Caterpillar 797 Mining Truck costs $3.4 million, weighs 1.38 million lbs., has a 3,370 HP engine and can carry 363 tons. What happens when one tries to carry 600 tons? An amazing fail documented in the gallery below. These photos were posted by user John Lee PeTTimore at the QuattroWorld forum, who was forwarded the image by a co-worker. We'd like to see the tow truck that showed up to carry this $3.4 million vehicle back to the shop.